An aid ship intercepted by the Israeli military while trying to break the blockade of Gaza has arrived in the Israeli port of Ashdod. Israel says its soldiers boarded the Irish-owned Rachel Corrie from the sea and did not meet any resistance. There has been no word from those on board, who include several activists. The incident comes five days after nine people were killed in clashes when troops boarded a Turkish aid ship, prompting international criticism. Turkish officials have released details of autopsies carried out on the nine dead activists, saying a total of 30 bullets had been found in their bodies. One of the activists was shot four times in the head, the officials said. The BBC's Jonathan Head in Istanbul says some of the details seem to contradict the Israeli assertion that their commandos used minimum lethal force. The crew and activists from the Rachel Corrie are being questioned at Ben Gurion airport while Israeli officials try to organise their deportation. Israel said it would transfer the aid to the Gaza Strip by land after checking the cargo for banned items. Prime Minister Benjamin Netanyahu hailed the peaceful outcome to the operation. "We saw today the difference between a ship of peace activists, with whom we don't agree but respect their right to a different opinion from ours, and between a ship of hate organised by violent Turkish terror extremists," Mr Netanyahu's office quoted him as saying. Mary Hughes Thompson, a co-founder of the Free Gaza Movement which organised the shipment, told the BBC she was "outraged" by the latest Israeli action. "They [the Israelis] once again went into international water and violently boarded a boat and forced people against their will to go to Israel, when all we wanted was to be left to go to Gaza, which is our goal," she said. She added that further aid shipments to Gaza would be organised. There are five Irish and six Malaysian pro-Palestinian activists, plus several crew, on the boat. The Rachel Corrie is named after a US college student who was crushed to death by an Israeli army bulldozer as she protested over house demolitions in Gaza in 2003. Israel has blockaded Gaza since 2007, when the Islamist Hamas movement took control of the territory. 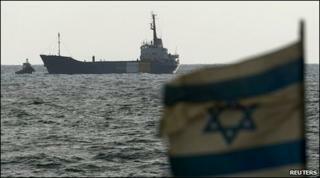 The 1,200 tonne cargo ship was boarded about 16 nautical miles (30km) off the Israeli coast. Your say: Was interception right? Israeli military spokeswoman Lt Col Avital Leibovich said the takeover took minutes, and the ship's captain had gathered the passengers in one area of the vessel. Footage taken by the Israeli military from a helicopter above the Rachel Corrie showed the activists sitting in the middle of the top deck. The Cyprus-based Free Gaza Movement is a coalition of pro-Palestinian groups and human rights organisations. The Rachel Corrie is carrying hundreds of tonnes of aid, including wheelchairs, medical supplies and cement. Construction materials are banned from entering Gaza by Israel, which says they could be used for military purposes by Hamas. Israel says its commandos were attacked with weapons, including knives, and opened fire in self-defence. Activists on the ship say troops shot at them without provocation. Israel says its policies towards Gaza will not change while Hamas remains in power and while rockets continue to be fired from Gaza into Israel. Protests over Israeli action against Gaza aid shipments were held in several cities around the world on Saturday, including Dublin, London, Istanbul, Paris and Cairo. There were also clashes in Tel Aviv between government supporters and protesters angry at the flotilla attack.